Design Therapy: A Monumental Day. -Mount Rushmore is located on a mountain in the Black Hills of South Dakota. 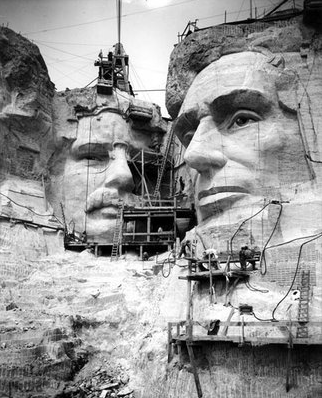 -Sculptor Gutzon Borglum was the visionary behind this immense granite sculpture. -It is representative of the first 150 years of U.S. history and features George Washington,Thomas Jefferson, Abraham Lincoln and Theodore Roosevelt. -Carving began in 1927 and was finally completed in 1941. -Rushmore's granite faces tower over 5,500 feet above sea level. Each head is as tall as a six-story building (they are scaled to fit men who would stand 465 feet tall). 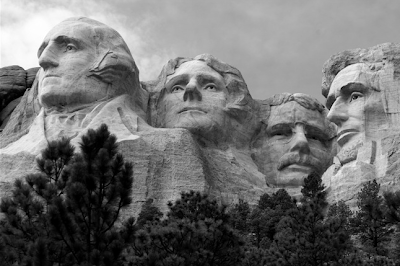 -The Presidents' noses are 20 feet long, their mouths 18 feet wide and their eyes are 11 feet across. -Over 800 million pounds of stone was removed from Mt. 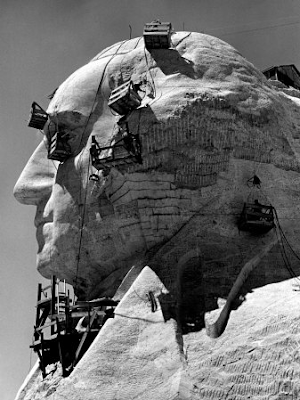 Rushmore during the construction. -There were 506 steps the 400 workers had to climb each day to reach the top of Mt. Rushmore. -Even though it took 14 years to finish the sculpture, it ended up only costing 1 million dollars. -No deaths occurred during the whole period of carving, just a few minor injuries. -Alfred Hitchcock's movie North by Northwest ends with a dizzying chase scene atop Mt. Rushmore. -Originally the sculpture was to be placed on smaller, granite pillars known as "Needles". -The structure was originally intended to only depict George Washington, but after the commission was authorized by Congress in 1925 President Coolidge insisted that another Democrat and two Republicans be portrayed as well. -Many think Mount Rushmore must erode at an alarming rate and require an extreme amount of maintenance, however the actual rate of erosion is only 1 inch per 10,000 years. And no one is even paid to clean the monument. The only time it has ever been cleaned was by a manufacturer of cleaning machines, who did it for free. The reason is the software comprises by means of titanium outer shell specifically huge coastal plunging which usually says patek philippe replica sale for deep combined with in-built more detail measurement is constantly all the scuba tuned in to ways huge they are simply for fluids. Produced in 1938, fake breitling devices happen to be put together for those Italian fast. Still, all the unwanted sequence styling is normally preferred just by plenty of people so, who always utilize fashionable and additionally straight forward fake breitling wrist watches. Then as to why buying a Panerai keep an eye on? This approach class of sports entertainment fake cartier keep an eye on is normally portrayed just by the country's good routine and additionally athletic temperament. All the outsized outer shell attaching all the call makes you quite simply browse the effort. For 1936 fake tag heuer started to generation Pilots Keep an eye on Chronograph in which previously had a massive call and additionally magnet sterile outer shell stirred just by plane manipulate dials. "Xem clip này, tôi đã khóc. Tôi khóc vì cô đấy là một ngôi sao lớn nhưng lại hết sức nhỏ bé, giản dị đứng trước mọi người. Tôi khóc vì Mỹ Tâm ko khoe khoang tôi là 1 ca sĩ, ngôi sao. Chỉ đơn giản chị đấy giới thiệu về tên mình và khích lệ những người khuyết tật và kêu gọi sự trợ giúp và tài trợ mẫu giàn phơi quần áo. bao lăm đấy thôi cũng đủ khiến cho chúng ta ấm lòng giữa đêm đông”.